Many applications require analysis of more than one of these gases. This may be the case for several reasons. Traditionally, specialized equipment and more than one separate analyzer would be required for analysis of more than one gas. This resulted in very complex systems with a large cabinet foot-print and high cost. 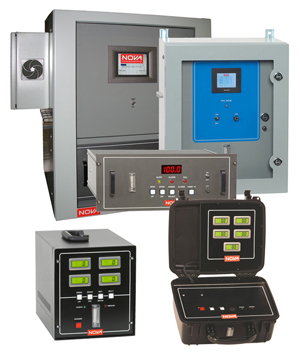 Over the years, Nova has developed gas analysis systems that integrate multiple analyses into a single instrument for a reasonable price. The principles of simplicity and modularity have helped guide the development of these instruments. We have also developed internal compensation for highest accuracy in our hydrogen analyzers. Hydrogen detectors can have interference from other gases in the sample. To maintain highest accuracy, we can measure the other gases and correct the hydrogen reading for the anticipated effects. We have also developed 2nd-order compensation capabilities for the reverse affects of hydrogen on the readings of the other gases. Even though there is internal correction for highest accuracy, none of our gas readings are calculated or assumed. All gases are actually measured by a relevant detector. The only time a Nova gas reading is calculated is when it is explicitly required; for example, calculation of balance nitrogen or heat energy. To properly configure and quote a multi-gas analyser, it is important to obtain technical information about the process being analyzed. The best way to do this is to fill out an application questionnaire. Of particular interest are the expected patterns of variation in each gas. We understand that there may be a ‘normal’ level for each gas while the process is running smoothly. However, there may also be periods of variation during start-up, shut-down, or process upsets. For example, the oxygen levels in a steel-making furnace may start high and drop rapidly as the process atmosphere is being established. The hydrogen levels may remain stable, but the interfering gases may vary widely during the process. If variable conditions exist in your process, it is important to provide details regarding these variables. We are also interested in the pressure, temperature, and particulate content of the atmosphere. All of these things will affect the design of the multi-gas analysis system. Ready for the next step? Please contact our Sales team for more information or view our product catalog for more information.